Lakeside Bungalow With Spectacular Views of the Lake! BACK NOW FOR SPRING OF 2019!!!! 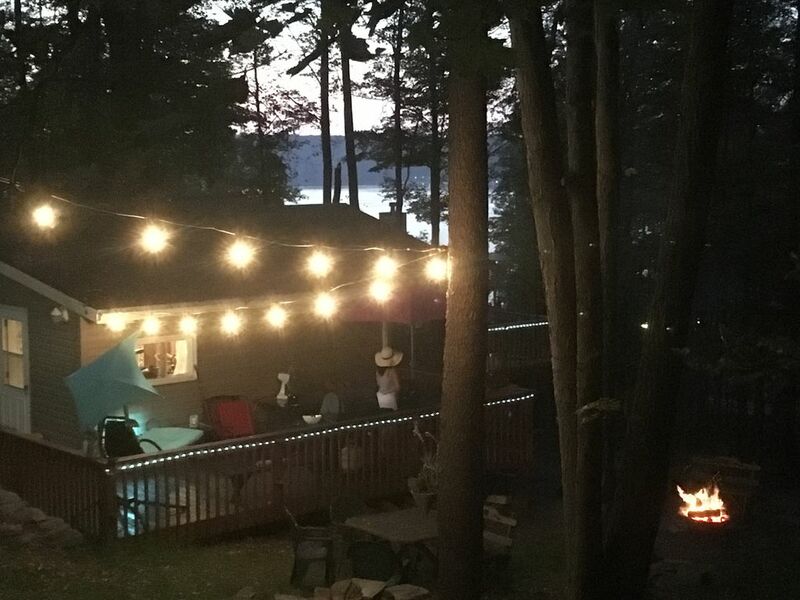 CREATE GREAT YEAR ROUND MEMORIES AT THIS LAKE HOUSE ACROSS THE STREET FROM WALLENPAUPACK WITH LAKE VIEWS! We are across the street from the Pocono Action Sports (aka) Lighthouse harbor marina. 5 minutes away from Pine Crest Marina! Rental of boats and jet ski, kayas & Transient boat slips are available as well as rentals for every kind of water sport at both both Marinas. 12 minutes to Promise Land State Park, which has a beach!, fishing ,Hiking, . picnic tables, grills. etc. Also close by horseback riding, antique shops ,Claws -N-Paws Wild Animal Park! Enjoy 2 Decks one off the master bedroom & one on the side of the house. 49" HDTV with a Netflex, Amazon Prime Movies, and DVD for all ages! T.V. 's in the 2 other rooms. This bungalow is 15 minutes to everything, restaurants like -The Dock, The Boat House and the Glass-Wine Bar @ Ledges, which we love the best. We will provide your marshmallows, popcorn & wood for the fire pit. Whether it's a family stay, Friends getting together or a romantic stay. So come and start making your memories . Coffee, Tea, Sugar, creamer, etc.. Beautifully decorated, extraordinarily clean with everything taken care of. A beautiful home with everything thought of. This property is cozy and welcoming. Large enough to sleep six comfortably. Nice view of the lake from the deck off the bedroom. Every little detail was thought of. We will definitely be back. We are so happy to hear you had a great time. We want to make sure that our guest feel at home. We are only doing limited rentals now but will be back in the spring! Thank you for being such easy going guest . Please do come back again. We will be having specials for our second time guest! Enjoy the Holidays. We are so glad you & Randy had a lovely time. We work very hard to ensure that the house is stocked ready for our guest to just come and relax with no worries. We will not be renting this winter, but will be back next year! Please be sure to come visit us again!! We loved having you both as our guest. Great experience! House was awesome...the area was awesome....and the owners made sure we had everything we needed for our stay. Will be looking to rent here again! Thank you so much for the lovely review & for being such great guests! We're so glad to know you had such a wonderful time. We are blessed with the location, so stunning & private, but so near to attractions. We look forward to having you & your family back next year! My sisters and Mom felt warmly welcomed in this cute and cozy Lake House. It had everything we needed for our Fall Getaway to celebrate our Mom’s 85th birthday together. Maria and Sean were very informative and wonderful to work with. While we were visiting we enjoyed the “Dock” restaurant, the Stourbridge Fall Foliage train excursion, Ledges, shopping antiques, the beautiful lake view and all the amazing wildlife surrounding this house. We wished we could have stayed longer but couldn’t due to work schedules this time! :( Thank you so much for having us! We are so glad to hear that you and your family had a wonderful time. I love that you girls got to do so many things in one weekend! We will like to thank you for sharing your pictures and your Family moments with us. :-)!! We look forward to hearing from you again next year! Thank you for being such wonderful guest!!! My parents and I had a wonderful stay here! The place is cozy, quiet, super comfortable and has all you need to spend a great time: fireplaces, barbecue, beautiful terrace and interior! And bonus, we met with a few deers that came to say hi in the morning, fantastic moment, great memories. I’ll highly recommend and cannot wait to come back! Thank you! We are so happy to hear you had a great time! Thank you for being such great guest. We look forward to sharing our home with you and your parents. Please do come back soon. It was a great first Fall weekend. Camp fire outside, fireplace inside after a day on the lake. Everything you need for a short stay was available. Comfy beds, wifi, and TV with Netflix always helps too. Just a great way to unwind and relax with a calm and peaceful home. We are so glad you liked our cozy home. Fall is beautiful at the lake house with all the bright colors. You are welcome to come back anytime. Sat Oct 6, 2018 - Sat Oct 20, 2018 ! Must be over 25 years old to rent. Picture I.D. will be requested for proof of age only.